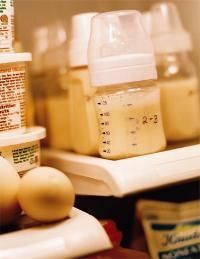 06.13.11 New federal law requiring lactation rooms is slowly but surely being implemented in jobs across the U.S. If you are a new mom and planning on going back to work, get familiar with this term: lactation room. You know, a place at your job where you can break out the breast pump and express the liquid gold for your nursing baby without feeling like you're doing something wrong. For some moms, it has been a beautiful and cozy room with a refrigerator; for others, well ... not so much. However, thanks to a new law that went into effect this year, working moms are now enjoying more federal support when it comes to pumping at work. Employers must now offer reasonable break times and private areas (read: NOT the women's restroom!) for pumping breast milk, as The New York Times reported at the time of the law's passing. So as you can see, it can be a toss up at first. When you find out you're expecting and let the cat out of the bag at work, check in with your human resources department to see what your options are when it comes to having a private place to pump. Make sure to emphasize that it's federal law now to have a lactation area available—know your rights! Having a plan in place will help you ease through your workday as a breastfeeding mom, no matter the situation. Head over to our Pumping in the Real World page for our pumping solutions to different workplace scenarios that you might encounter. Remember you don't have to quit breastfeeding when you go back to your job. Check out our Pumping at Work page for techniques and tools to help you pump successfully.